The very best cod is caught between January and April in the crystal clear waters around Norway’s Lofoten Islands, having migrated thousands of miles from the Barents Sea. This cod has bright, white flesh that gleams of the icy, dark waters that the fish swam through to get to Norway. On cooking, it produces huge, firm, pure white flakes, glistening on the fork. It’s a fish of exceptional quality, and holding a fresh portion in your hand, it’s easy to see that quality. This is fish that looks good, and tastes better – clean, lean, fresh, rich. The Norwegians designate the very best of this cod with the SKREI label, and it’s this that you should look out for when buying cod at this time of year. The SKREI I had to hand this week went into a frankly quite beautiful tomato curry. 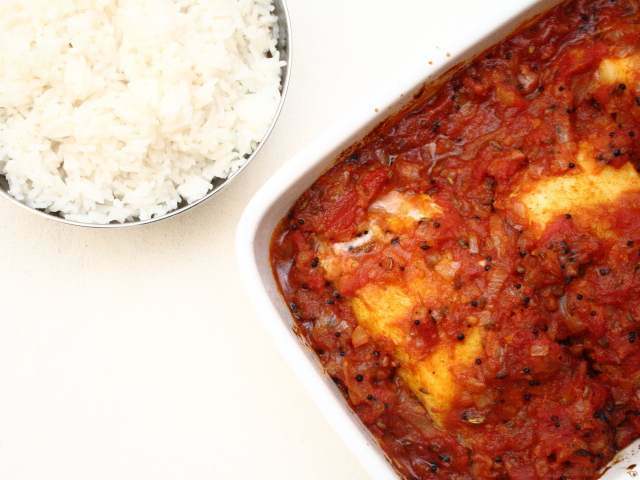 The mild spiciness of an Indian tomato sauce is the perfect foil to the firm, clean flakes of cod. It’s a lovely combination. SKREI cod tends to come in big, sturdy chunks, muscular pieces of fish that hold together whilst cooking. This dish will produce an impressive hunk of fish, cooked gently in its sauce and served with basmati rice. You could make this dish with any other white fish, but it’s best with a cut of some thickness. First, some pre-preparation. Use one fish steak per person – the size of the portion depends on what you want, but I’d suggest a piece per person that sits comfortably in the hand. Dry the fish with a tea towel or a piece of kitchen paper, and then mix together a quarter of a teaspoon each of salt, cayenne pepper and turmeric. Dust the fish with the spices and pat them in, so that the steaks are evenly covered. Cover the fish and leave it in the fridge for half an hour for the spices to work their way into the flesh. Next, heat a generous glug of groundnut oil in a pan and add a teaspoon of mustard seeds, and a teaspoon of fennel seeds. The seeds will crackle and spit, and when they do, add a couple of finely chopped onions and two crushed cloves of garlic. Fry the onions and garlic until they’re just starting to turn brown, then add two teaspoons of ground cumin seeds, a teaspoon of salt and another quarter teaspoon of cayenne pepper. Straight away, add the contents of a 400g can of chopped tomatoes, a quarter of a teaspoon of garam masala and half a teaspoon of ground roasted cumin seeds. To roast the cumin seeds, just toast them gently in a dry pan until they start to darken slightly. Cover the pan and lower the heat. Leave to simmer for a quarter of an hour. Lay the fish steaks out in a single layer in a baking dish, then pour the sauce over and between the fish. Bake, uncovered in an oven preheated to 180c for about fifteen minutes, then serve the fish with rice. I made this dish for the kids on Saturday. They love fish, but particularly salmon and other oily fish. Cod, haddock, and other white fish is favoured covered in batter or breadcrumbs, and why not? The eldest is starting to develop a taste for spices, but the youngest is far less adventurous. I said little about this curry as I served it up, just that it was fish and the sauce was made out of tomato – both staggeringly obvious observations. They looked suspicious, prodded a little, tasted tiny forkfuls that quickly became larger as they discovered those majestic flakes of SKREI hidden in a mellow, tasty tomato sauce. Both finished their cod, both wanted more sauce to eat with their rice. I have that cookbook. Ms Jaffrey is great. Your kids are lucky too, to have such a great dad. Mine are too cynical now to trust me. Hi Rich. Could I ask where you got your Skrei cod from? Booths have it, but ring before you trail over to Ilkley especially. For the first time this week, I bought some fcod from the nice man with a van from Grimsby who comes to the end of our road (in Otley) every Tuesday morning. It was truly the best fish I have ever eaten. Can’t wait to buy some more and try this recipe. Thanks for posting.